Fridge, lights, TV, computers? YES. Kettle, toaster, hairdryer, washing machine, dishwasher NO. These were the parameters for a minimalist off grid PV system for a friend’s pod. Low power but low price. Tempted by an ad for some second hand panels from Canada we were soon knocking on the door of Bimble Solar near Brighton. We fancied 4 PV panels and were shown into a large barn with stacks of panels up against the walls. ‘Which ones are ours then?’ we asked. ‘Any ones you like’ was the answer. They were mostly second hand and we settled on the 300Watt ones from France; defunct solar farm casualties. Apparently there are many solar farms either going bust or upgrading so there will be heaps more cheap panels to come. As panels should last 20 years it makes sense to start off with cheap used ones – who knows what the possible upgrade will be in ten years or so. This charges the batteries efficiently and safely. Tells you what is going on with every part of the installation. The supply of power is looking very generous for the summer but will hopefully still be close to requirements in the dark winter when the input from the panels will just about halve. There is a section in my book ‘Dream House – Down to the details’ on Amazon – here – which discusses the idea of using systems like these as large uninterruptible power supplies, in daily use but keeping the mains as more of a back up. There are charge controllers (e.g. Victron) designed to do just this so the UPS concept is really quite simple to implement. The Bimble web site is a delight to browse through. I was particularly taken with the circa £1,000 heat pumps at a fifth of the usual prices and looking good value with Toshiba compressors and modern r410a fluid. A heat pump is just like a large fridge, and usually just as reliable, so one of these might be worth a punt at this price but you might need advice on what to connect them to. In all probability these are Chinese but they often come with quality European components so they should be mechanically sound. 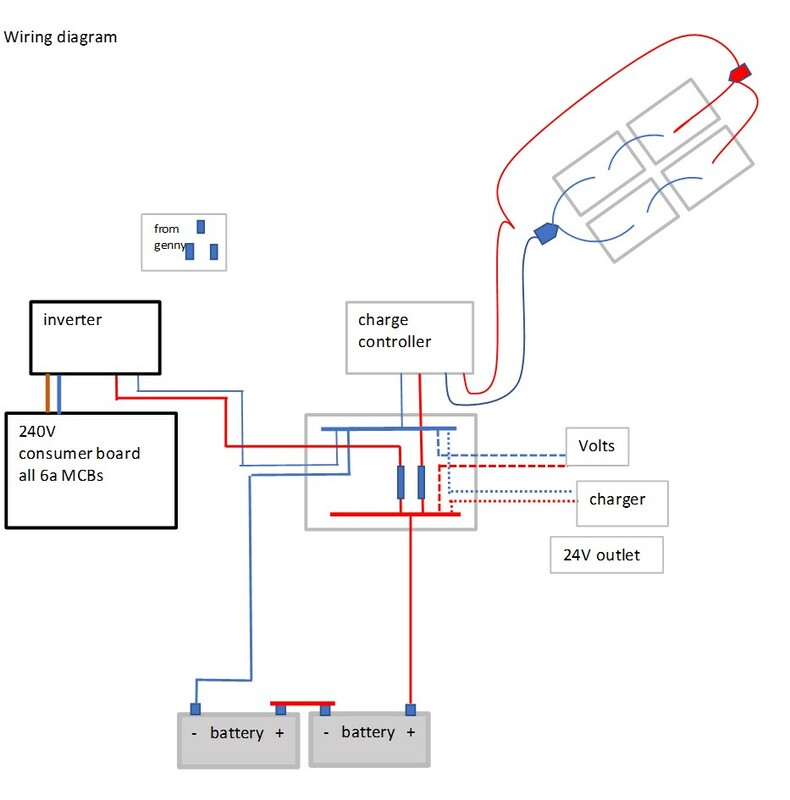 Have a look here at a system especially suited to integrating heat pumps. The Rinnai 16i in-line gas water heater – a solution for guest houses? This useful boiler heats water just as you use it but without the losses incurred from storing the hot water in a tank. The water is delivered at the set temperature which can be quite low compared to stored water. It is powerful too – like having a couple of combi boilers together. Being much simpler than a combi though, the Rinnai only costs £500 and for larger properties it makes sense have more than one with the added reliability when the outputs are cross linked. The Rinnai is marketed as a base for a tankless system but its modulating feature makes it even more effective when used in conjunction with a tank. For example if you were running a small guesthouse, needing an unlimited hot water supply, you could use wood and solar to heat the tank and only use the Rinnai to top up the hot water coming from the tank when necessary. The boiler only uses enough gas to raise the water temperature to the set point so when pre-warmed water arrives the gas throttles back. With cheap energy sources pre-heating the water, gas consumption will plummet but constant supply will be maintained automatically. The Xcel heat banks I supply have been used like this for years so if you want to discuss such a system let me know. If you were in Italy this summer you might have experienced temperatures of well over 40 degrees. As there is almost a whole year to go before that all starts again perhaps a cool look at some air conditioning might be in order. You’ll know those portable units where water is evaporated and exhausted to the outside through a tube. It takes a lot of heat to evaporate that water. Imagine trying to boil a large saucepan of water dry on your stove – that’s how much heat is needed and how much heat would be removed from the air. So if a lot of water can be evaporated then things will tend to cool down, a lot. The cheapest way to employ this principle is to mop your floors in the early morning and open up the doors and windows to let the moist air out before you have to close up again. Chilly floors will get you comfortably through the rest of the day. My school in Kenya had a cool room made with wetted charcoal walls; a great example of the power of water evaporation. If you fancy making an evaporative aircon unit I have a design using charcoal, irrigation hose and corrugated pipe …. happy to share. Nights can be unpleasantly hot though so what about them? Well the outside temperature falls off a good 10 degrees from the highs of the day and if it wasn’t for intruders and mosquitos it would be great to open up the windows again, especially the downstairs ones where natural convection will move the hot air up through the house. Mosquito nets over barred windows make a good start but it takes a lot of air to make much difference so a fan on the window sill will help to pull in that lovely cool air. The air it displaces will need to get out so other netted windows will be needed upstairs. Evaporation is the last thing you want on your pool, it not only lowers the temperature, it uses significant amounts of precious water too. A liquid pool cover is the answer. One or two £20 fish shaped sachets of liquid in your strainer slowly dose the pool with a molecularly thin coating that floats on the top and prevents evaporation for 5-6 weeks. Well done Martin Daykin for trialing this product and telling us about it. It works. The heat bank specification just got better. No doubt you know this is a stainless steel tank with a complete plumbing solution – pumps, valves, wires, solar coil etc – all fitted to it and ready for a speedy installation. Two new mods are available. To prevent the heating pumps depleting the hot water too much there is a new cut off thermostat; unless extra heat is being supplied to the tank the pumps will cut off to leave a block of hot water at the top of the tank. Home automation enthusiasts will welcome a couple of extra sensor pockets for temperature monitoring. One use might be to turn on the domestic hot water pump to deliberatly destratify the tank, when it becomes very hot, before the overheat stat turns on the heating. Now the hottest water is sent down to the cooler bottom of the tank and as the whole tank becomes uniformly hot the effective capacity is increased. There is still time to get your heating organised before winter so do get in touch if you want to discuss your strategy.